The right-wing bloc is projected to win 64 seats, compared to 56 for the center-left. (April 5, 2019 / Israel Hayom) Israeli Prime Minister Benjamin Netanyahu has been trying to shake up Likud supporters to get out the vote. The last Israel Hayom-i24NEWS poll conducted before the April 9 election shows that he has reason to be concerned. If the election were held today, the Blue and White list under Benny Gantz and Yair Lapid would win the largest number of seats, 32, with the Likud in second place with 27 seats. This week’s poll, conducted by the Maagar Mohot Institute under Professor Ytzhak Katz, polled an especially large number of Israelis. More than 1,000 people in a representative sample of the population responded to questions over the phone or on the Internet. The margin of error was 3.1 percent. By law, no additional polls may be published until voting in the election is over at 10 p.m. on April 9. While the center-left Blue and White Party was projected to win the largest number of seats, the right-wing bloc as a whole still held a substantial lead—with a total 64 projected seats, compared to 56 for the center-left—assuming that Zehut leader Moshe Feiglin decides to join the right-wing parties, despite his attempts to obscure his far-right background. More than half (52 percent) of respondents said they thought Netanyahu would be Israel’s next prime minister, compared to only 27 percent who thought it would be Gantz, and another 21 percent who said they did not know who would be prime minister. The poll projected 10 seats for the Labor party and eight seats for Meretz. The Ashkenazi ultra-Orthodox party United Torah Judaism was predicted to win eight seats, while the Sephardi Shas party was predicted to win five. Kulanu under Finance Minister Moshe Kahlon was predicted to win six seats, as was the Union of Right-Wing Parties (Habayit Hayehudi-National Union-Otzma Yehudit) and the New Right Party formed by Education Minister Naftali Bennett and Justice Minister Ayelet Shaked. According to the poll, Yisrael Beytenu under former Defense Minister Avigdor Lieberman, would not make it past the minimum electoral threshold. A total of six seats were projected for the Arab Hadash-Ta’al Party, whereas Balad was not expected to pass the minimum threshold. In addition to looking at which parties respondents planned to vote for, the poll also tried to determine how certain they were about their party choices. It turned out that Netanyahu’s claim that Likud voters were asleep at the wheel while Blue and White supporters were fired up turned out to be correct. Among respondents who said they would absolutely be voting, Blue and White received 34 seats, compared to 26 for the Likud. Among respondents who said they were certain they would vote, the Labor Party gained a seat. United Torah Judaism and the Union of Right-Wing parties also gained seats in the sector of die-hard voters. Still, the sector of “absolute” voters gave the right-wing bloc 65 projected seats, compared to 55 for the center-left. In addition, the poll looked at potential voters who were still undecided, 26 percent of whom said they were leaning toward voting for one of the parties on the right; 27 percent of whom were leaning toward the center; and 19 percent of whom said they would be voting for one of the left-wing parties. Most of the public is also opposed to the idea of a unity government under the leadership of Likud and Blue and White—46 percent they were against a unity government, compared to 31 percent who favored the idea. However, the idea was more popular among Blue and White supporters, 43 percent of whom said they opposed a unity government and 41 percent supported the idea. 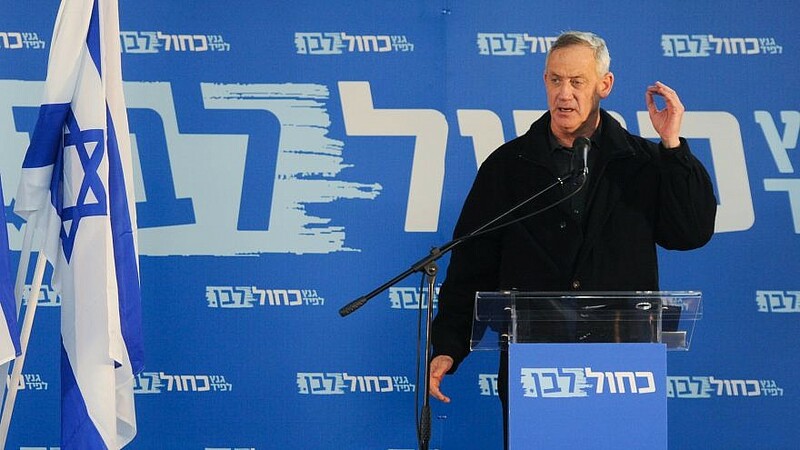 The Labor Party has said that if Lapid were to forgo his rotating leadership agreement with Gantz (under which, if Blue and White were to win the election and assemble the next government, Gantz would serve as prime minister for the first two years of its term and Lapid for the next two years), the party could attract more voters from the right. The poll looked into that scenario and found that most respondents said that Lapid giving up the rotation agreement would not affect their vote. Among those who said it might affect how they cast their ballot, 9 percent said it would prompt them to vote for Blue and White, whereas 4 percent said they would leave the party if Lapid gave up the rotation. When asked to rate the election campaign as “fair,” “appropriate,” “violent” or “dirty,” a whopping 69 percent said it’s been a dirty election.